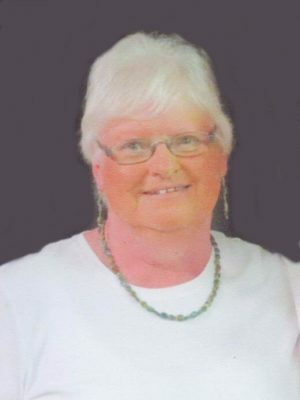 We are saddened to announce the passing of Catherine ‘Kay’ Digou, age 71, on Friday, November 30, 2018 at the Cape Breton Regional Hospital, Sydney. Kay was born in Sydney on May 7, 1947 and grew up on Roberts Street in Whitney Pier. This ‘Pier girl’ married her only sweetheart, a ‘Bar boy’, Robert Digou, in the middle of a blizzard on Feb 20, 1965, at the tender age of 17. Together, they ventured to Kingston, Ontario, to obtain employment, then, nearly eight years later, returned ‘home’ to South Bar, where they wanted to raise their only son. Kay spent many years as a devoted stay-at-home mother, a period broken only when working Saturdays and summers across the road at Allan’s Dairy. Eventually, Kay returned to the workforce full-time as a cashier at Wilson’s Home Hardware, where she spent eighteen years. She was, without question, and old-school cashier. As the first and last person each customer encountered, Kay took seriously the responsibility of ensuring each customer felt not just satisfied, but also welcomed and appreciated. Kay and Robert had a rare, special, relationship. Their bond, forged in the fires of youth, gave them a state of everlasting unity even before they reached adulthood. They were devoted to each other with a degree of commitment seldom seen today. ‘Forever’ was always understood, rewarding them with a mutual sense of security. Kay was, inherently, a wife and mother. She was defined by those dual roles, and she embraced them. Everything else was secondary. She was the care giver, the supporter, the worrier, and the glue bonding the family together. She spent countless hours at the ironing board, and always made sure her family came home to a hot meal. Kay’s overwhelming desire was to be a mother. Her son came first, and (usually) could do no wrong in her eyes. Even through adulthood, her son could always depend on receiving her advice and guidance, (invited or not), as she felt necessary. As a devoted daughter, Kay spoke on the phone with her mother daily. She also made frequent visits to check on her parents, for she was their primary mode of transportation for many years. In their final years, Kay put in great effort to ensure her parents’ wish to remain in their own home until the end was fulfilled. Kay thoroughly enjoyed traveling with Robert. Whether on an Alaskan fishing boat, in a camper in Ingonish, or on the back of a motorcycle in a New Hampshire thunderstorm, she loved sharing adventures with him. Closer to home, Kay enjoyed spending time at their summer retreat in the Bras d’Or Lakes in Aberdeen, near Whycocomagh. While there, she spent quality time visiting with neighbors, and critiquing the never-ending construction of the ‘Boathouse’. In later years, Rob and Kay escaped much of the Cape Breton winter by joining many new friends at their park in central Florida. She gained great pleasure in finding deals at flea markets, especially buying Pyrex teapots for resale back home. Kay was a hard-core fan of the television show ‘Big Brother’ since it began. She would become quite uneasy if they were away from a TV near broadcast time. Kay was predeceased by her parents, Leonard and Margaret (Healy) French, as well as an infant son. Kay is survived by her husband of 53 years, Robert and her son, Robert Jr. (Rosie Weiman). She is also survived by brothers, Leonard ‘Butch’, Ontario, Ray, Ontario, Ernie French, British Columbia, and as well as many extended family members. Visitation for the late Catherine ‘Kay’ Digou will be held on Tuesday, December 4, 2018 at the Pier Community Funeral Home, 1092 Victoria Rd. (entrance on Church Street) from 2-4 and 7-9 p.m.
Memorial service to celebrate the life of Kay will be held in the funeral home on Wednesday, December 5, 2018 at 11 a.m. in the All Faith Chapel with Fr. Paul Murphy officiating, with a reception to follow. Interment will take place in St. Alphonsus Cemetery, Victoria Mines. Donations in memory of Kay may be made to the Hospice Palliative Society of Cape Breton County. The family would like to thank the Cape Breton Regional Hospital staff on Units 4B and IMCU for their compassionate and professional care and support throughout her ordeal. Dr. Farokh Buhariwalla and Dr, Catherine Buhariwalla, along with the multiple specialists involved, also provided unsurpassed care. Our condolences to Robert and family. Kay was a good person to all. R. I. P. Kay. Kay was a very special person who left a lasting, positive impression on everyone she met. Her nightly presence around the campfire at “The Ridge” will definitely be missed . Please know my thoughts and prayers are with you during this very difficult time. So sorry for your loss. Our deepest condolences to Robert and the family. Sad to hear of Kay’s passing, I know how much she will be missed. Truly sorry to lose such a sweet, caring, and outgoing individual. You will be sorely missed. So sorry for your loss Robert and Robby. She will be missed. We join with you today by words and prayers to offer condolence on the terrible loss you all are facing. But, of course this loss is immediately tempered by the many happy moments that we all have shared with both of you over the years. It was something special in my life to work with Kay at Wilsons for so long. I was always glad to have such a dedicated fellow employee on the team. She helped the days go by in a better way due to her smile, her humour and positive outlook on life. The many travel adventures you both had were heard with much interest and lots of joy. Unfortunately there are always too many difficulties with our lives in today’s world! But God has promised a change coming soon in our future. Revelation 21:4 says: “He will wipe out every tear from their eyes, and death will be no more, neither will mourning nor outcry nor pain be anymore. The former things have passed away”. We hope that you will gain comfort at this time from all the good wishes and love now extended to you and your family. Should there be any future occasion where we can offer personal assistance, please let us know. Very sorry here this sad news. We were very sorry to hear the sad news of your mother’s passing. We’re thinking of you and sending our deepest condolences. Bob & Family, My deepest condolences. Kay was one of a kind person–always friendly and willing to be helpful. She will be missed by her many ‘Ridge’ friends Our prayers are with you and your family, Rob, during this time. We were saddened to hear of Kay’s passing. She will be remembered as very warm and caring person. Our deepest sympathy.